The Contemporary Dance Network Philippines invites you to come and join in the 2010 Contemporary Dance Map celebrations of the International Dance Day. 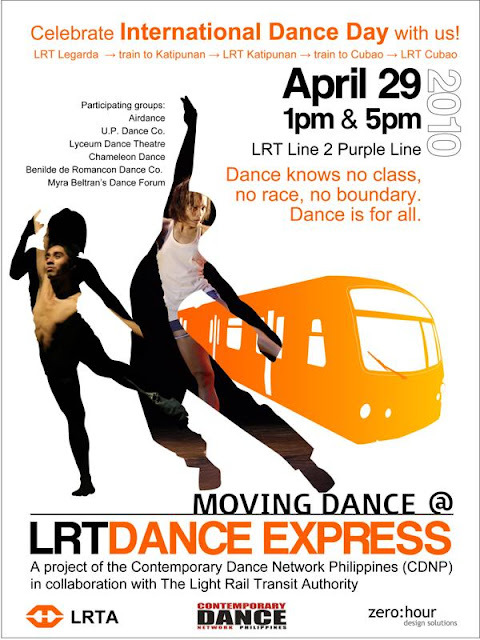 Opening with Moving Dance @ The LRT Dance Express on April 29, 2010 at 1pm and 5pm at the LRT Line 2 (Purple Line) with performances at Legarda, Katipunan & Cubao stations in the train while it is on transit. Our concept is to blur the line between the normal and the everyday with the idea of “performance." April 30, 2010 concludes the International Dance Day celebration at the Dance Forum space in 36-e West Avenue Quezon City at 8pm. Tickets are at PhP 200 each and student price at PhP 100 each. Participating groups are Airdance, UP Dance Company, Lyceum Dance Theater, Chameleon Dance Theater, Benilde de Romancon Dance Company and Myra Beltran’s Dance Forum.